Admission is free. Reservations required. RSVP beginning Thursday, February 28, at 9 a.m.
What is scholarship? Who is considered a scholar, and who deserves to be one? The poverty scholarship of Lisa “Tiny” Gray-Garcia was born in the streets, prisons, shelters, tenements, and other places that people don’t look for educators, experts, artists, or media producers. Formerly homeless and incarcerated, Tiny is an Oakland-based poet and journalist who wrote Criminal of Poverty: Growing up Homeless in America and co-founded POOR Magazine in 1996. 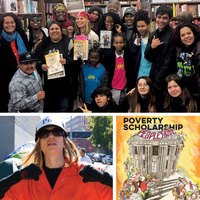 The publication has evolved into a non-profit, grassroots, arts organization dedicated to promoting arts, education, and solutions from and for youth, adults, and elders in poverty across America. To celebrate the release of her new book, Poverty Scholarship: Poor People-Led Theory, Art, Words, and Tears Across Mama Earth, Tiny will read, recite poetry, and share a new canon on poverty, houselessness, and otherness based on lived knowledge, eldership, and community sharing. Presented by USC Arts in Action, part of USC Visions and Voices: The Arts and Humanities Initiative. Arts in Action plants seeds for positive social change by activating intensive arts projects between L.A. community partners, students, and faculty.